We got our taxes back recently, so I decided to help out the economy some by getting a few more things from Down Sunshine Lane. 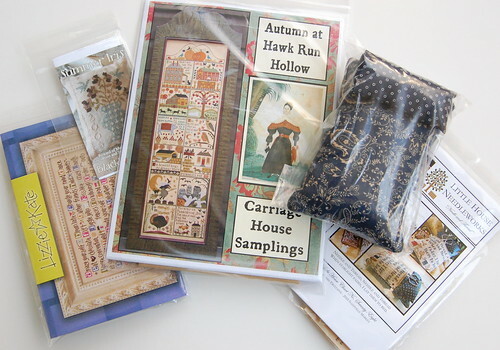 Lizzie Kate "Aging Artfully," Blackbird Designs "Summer Iris," Carriage House Samplings "AaHRH," LHN "Needle and Thread Sampler." 40 ct. Lakeside Linen "Sand Dune" and Thread Gatherer "Rusty Amber." I thought I could resist Autumn at Hawk Run Hollow, but that picture Glenna took at In Stitches kept coming back to me and couldn't resist any longer. I'm not sure when I'll actually get around to stitching it - Maybe in the fall. I did work on Shores of Hawk Run today (I'll post a pic tomorrow). I'm really enjoying it. I thought I would mention that the dyeing of the Summer Khaki with Tan Rit Dye wasn't my idea. It was Tanya's from The Scarlett House. She dyed her fabric for her Harriet Burry Sampler the same way. It makes a great fabric color, so I want to thank Tanya and give her credit for such a great idea! I also got a few of the new Shepherd's Bush kits (My Land, Lucky and Patriotic Scissor Fob). My favorite is "My Land." I love the fabric and threads. I really fell in love with it after seeing Coni's wip (scroll down). It's so pretty. I think it will make a great companion to my "Finch Song." Shepherd's Bush Kit "My Land." 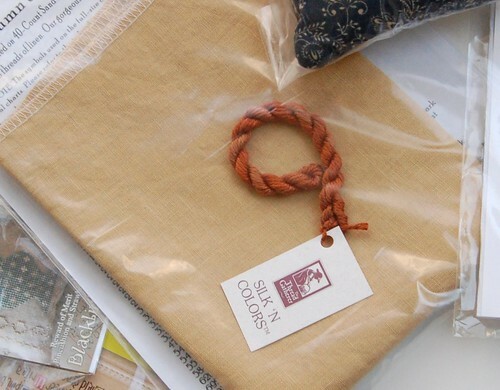 Included in the kit are Various Silk threads and 30 ct. Parchment Linen by WDW. Tomorrow, Matthew (my three year old) and I are going to head up to Amy's for lunch. I had originally planned to go on Saturday, but I found out that my son Jake, who is seven, is having his very first soccer game - ever. I couldn't miss it - he's so excited! I felt bad that I wasn't going to be able to make it to Amy's because 1. It's her birthday and 2. I promised her a cake! I told her I would make it up to her somehow and it worked out that we could meet up tomorrow. Hopefully the weather will cooperate for my drive up! Absolutely great new stash. Enjoy! Great stash, Nicole!! That Sand Dune looks scrumptious. Good luck to your son in his first game! Between you and I....we're keeping Amy in business :) LOL! I have Finch Song too...got it last year when it came out. Guess where it is? Hint - not on any q-snaps. Great stash! I love stash...... Have fun with Amy! And good luck to Jake at his soccer game! Have a safe trip and good luck to your son :-). You wait, I think from elementary through high school no free weekends in the spring or the fall because we were at one game or another, LOL. Great stash!! Good luck to your son on his first game - how exciting! Great stash haul, Nicole! A big thank you for doing your part for our economy!!! Great new stash! :D That LHN scissor bed seems to be REALLY popular; I can see why! Any progress on Anniversaries of the Heart? Ooooh, lovely stuff!! Anxiously waiting for my Autumn too. Love your new Stash Nicole! Lovely new stash. Have a fun day with Amy. Hope your son wins his match. Great stash Nicole. I picked up a lot of the same things that you did. Hard to resist them. I saw Tanya's post about the Rit Dye too, but I'm scared to death to try it, but it does give some great results!! Congratulations on the stash! Glad you joined the AaHRH group. No I haven't started it yet as I am still on CaHRH and VoHRH. So much to stitch - not enough time! Happy Stitching! Hope your day with Amy was fun! Oh I like this railing(bar), what a work but cà be going to be magnificent! You have some really nice stash there Nicole! I also think that the new Shepherd's Bush will go good with Sail Away and Finch Song. I love them all and hope to get My Land eventually too! Hope you have a wonderful time for Amy's Birthday! The stash looks wonderful. Hope you're enjoying your visit with Amy. Did you come home with any more stash? Great stash!!! I couldn't resist Autumn either. :) I ordered the chart first and then decided I better grab the fabric while it is still available. Good luck to your son in his soccer game. 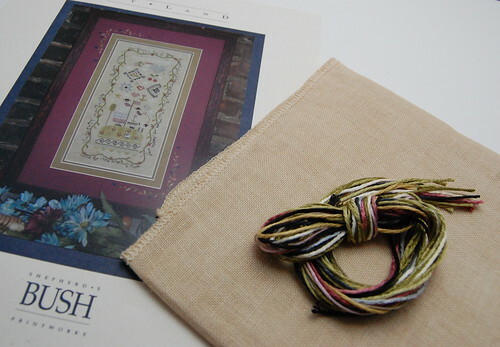 Excellent stash - the Thread Gatherer looks so pretty on that fabric! I probably won't be able to resist Autumn AHRH much longer either. Great stash. If only I had a tax refund to come....I'm having to be good as I've bought quite a bit of late. Love your blog.